While not the most portable clothes washing system we’ve written about here on PortAbout, this little R2-D2 lookalike has nevertheless caught our attention and piqued our curiosity. It’s still plenty small, but don’t let that fool you – despite its small footprint, this little guy could have a big impact on your washing routine, especially where it comes to delicates, small loads, and water and energy usage. How many times have we thrown up on ourselves at a wedding reception rager only to leave the shirt and tie in the laundry another week because we don’t have enough other items or delicates to wash? Right? OK, maybe we’re projecting here. Seriously, though, no matter how fancy the latest generation of high-tech washing machines, with their super-duper, ultra-sensitive sensory capacities and whatnot, aimed at using just the right amount of water or conserving energy, it still always feels like it’s a little wasteful to run those small loads or delicates through the machine. One continues to feel like just a bit too much water has been used still, and then there’s the energy usage in running the machine in the first place. Moreover, machines can really screw up delicates, putting you in a position to have to hand wash them instead. Well, enter the Drumi. 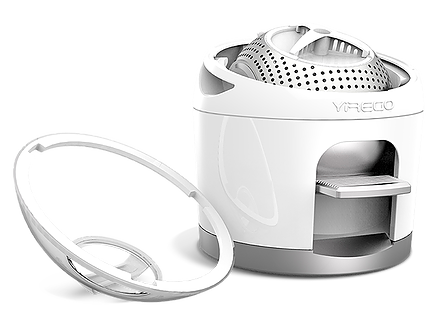 This little round-headed robot-lookalike with its can-do attitude comes to us from the designers at Yirego in Toronto, Canada, where it has won several awards. At only 22″ high and 15.5″ in diameter at its widest, this small trashcan/robot cross can handle up to six or seven small or light garments. Pooped your pants? Drumi’s got you covered. The difference between Drumi and R2-D2? No power required here. 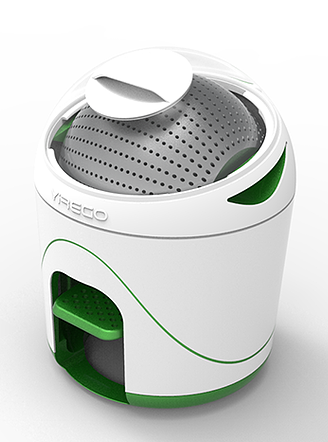 Twist open its head, remove the detergent tray from the sphere, toss your garments into the internal ball cage, replace the detergent tray (which can hold up to three detergents at a time), add your five or so liters of water, close the drum back up, and get to work on the foot pedal at its base. Watch through the clear head as you wash your clothes with two minutes of pedal power. Then, press the button at the back of the head to drain your sudsy water. Add another round of clean water and with two more minutes of foot-pumping action (just imagine you’re jamming on a bass drum), finish the rinse cycle. Drain again. Finally, with one more minute, finish the spin cycle. Voila, the process is complete in five measly minutes. Five minutes of calf-exercising human power and you’re done. Now, how long would that delicates or small-loads cycle take in your fancy washing machine, and how much energy would you be pulling in off the grid? Don’t get us wrong, we don’t see the Drumi replacing your home washing machine altogether, especially if you’re a big family with large and constant laundry needs, but we do see this little guy as a great accompaniment to your existing machine, even if you do own one of the super-duper, ultra-sensitive sensory-capacity types with its energy- and water-savings modes. With the Drumi, you could save even more water, energy, and frankly, time. Additionally, there are those specific situations or living arrangements that almost dictate that you own something like this if you want to get a spot of laundry done easily, including motorhome travel, trailer living, shared housing, or the dorms. While Yirego suggests that the Drumi could even be taken camping, we wouldn’t think so unless it was KOA style with a vehicle involved. Otherwise, we’d much rather haul around the Scrubba for that or for long travel expeditions out of a backpack. Anyway, we’d consider this a fantastic appliance for most any living situation where size or savings in energy, money, and time matter, and let’s face it, savings always matter. The Drumi is currently available for pre-order with delivery expected sometime in July of 2016.